The word "yeast" comes from the Sanskrit 'yas' meaning "to seethe or boil". Yeast is a living organism and is in the air around us. It is a member of the fungus family and is a single-celled fungi of which there are about 160 different species. Baker's yeast as well as brewer's yeast belong to the Saccharomyces cerevisiae species. Louis Pasteur in the 1850's is credited with first discovering and understanding the fermentation process which led to the development and cultivation of the yeast we use today. Baker's yeast, like baking powder and baking soda, is used to leavened baked goods (breads, Danish pastries, brioche, croissants). The difference between these two leaveners is that baking powder/soda react chemically to produce the carbon dioxide that makes the baked goods rise. Yeast, on the other hand, is a living organism and the carbon dioxide it produces is the result of the yeast feeding on the dough. The two forms of baker's yeast are; compressed cakes (also called fresh yeast) and dehydrated granules (dry yeast). Fresh yeast is ivory colored with a yellowish hue and is soft and moist and should easily crumble. Make sure it is fresh smelling and there are no dark or dried places on the yeast. It is mainly used by professionals as it is highly perishable and must be used within a short time of opening. It is sold is .06 ounce foil packages and must be refrigerated. For longer term storage it can be frozen. Compressed yeast contains about 70% moisture. It needs to be proofed before using and should have a pleasant yeasty smell and be foamy. Dry yeast is fresh compressed yeast that has been pressed and dried until the moisture content is only about 8% which makes the yeast dormant. The granules only become active again when mixed with a warm liquid. The advantage of dry yeast is it has a much longer shelf life than fresh yeast and does not need to be refrigerated. This makes it a favorite among home bakers. The tiny, dehydrated, bead-shaped, sand colored granules are most often sold in convenient small foil-lined packages weighing 1/4 ounce (7 grams) that have been packaged under pressure. Always check the expiration date on the package before buying. It is also sold in 4 ounce jars but once opened, the yeast needs to be stored in the refrigerator away from moisture, heat, and light because once yeast is exposed to air it deteriorates rapidly. You may have noticed that in some recipes it calls for dissolving the yeast first in a warm liquid and then adding this active yeast mixture to the flour. Other recipes, however, call for the yeast first being added to the flour and then the warm liquid is added. The dissolving of the yeast first in a warm liquid is done to make sure the yeast is still fresh and active. This step really doesn't need to be done though because of how reliable the dry yeast is today. Also, the dry yeast has such a small granule size that it dissolves easily into the dough without having to be reconstituted separately. Some bakers, however, still feel that it is a good idea to test the yeast to make sure it is still active before adding it to the flour. Yeast must have three things in order to grow: Moisture, Food, and Warmth. To activate yeast the first step is called proofing and is a way to test the yeast to make sure it is alive and still active. This is accomplished by mixing the yeast in a warm liquid. In order for yeast to become very active it needs food. It's favorite food is sugar, simple sugars to be precise (glucose and fructose). Some recipes call for adding granulated white sugar which the yeast will break down into its simpler form. But in some bread recipes where sugar is not used, flour can be added to the warm liquid and the yeast will break down some of the starch in the flour to a simple sugar. Once the yeast, liquid, and flour are mixed together and distributed, the next step is to knead the dough. This step is done to aerate the dough and develops the gluten (elasticity) in the flour. As you knead (press-fold-turn action) pockets of air are developed in the dough. The more you knead the smaller and more numerous the pockets of air become. How the dough is kneaded will determine the final texture of the bread. Dough with larger air pockets will produce a bread with a coarser texture. Commercially made breads or homemade ones that are kneaded by machine tend to have a finer texture than breads kneaded by hand. You'll know when the dough has been kneaded enough as it takes on a smooth and satiny appearance. The next step is the fermentation or rising of the dough. This is where the dough is placed in a greased bowl and covered with plastic wrap or a clean dish towel to avoid moisture loss and a dry, crusty surface from forming. The dough is then left in a warm, draft-free environment to rise until about double in size. The rising starts slowly as the yeast begins to feed on the sugar. Carbon dioxide and alcohol are produced and the carbon dioxide stretches and expands the existing air pockets in the dough and the dough starts to rise. This is also where the bread's flavor is developed. A dough that doesn't rise sufficiently will be very compact. Once the dough has doubled in size this signals the next step i.e. the punching down of the dough. This 'punching down' is where the dough is deflated, thereby releasing the large air pockets formed during rising and evenly distributes the temperature and yeast throughout the mass of dough. Depending on what you are making, at this point there may be a second rising. Otherwise, the dough is shaped and placed in a pan and allowed to rise for a shorter period of time. The final step is the baking of the bread. The temperature of the oven can vary depending on the baked good. A sweet dough is normally baked at about 350 - 375 F (175 - 190 C). Other dough can be baked at a higher temperature 400 - 425 F (205 - 220 C). During the first part of baking, before the yeast is killed, the dough will rise as you get a last bit of carbon dioxide being released and expanding the air pockets. Once the yeast is killed and the interior of the baked good heats up enough, the dough will set. The last part of the baking is where you get surface browning and this adds flavor and texture to the baked good. Often times the surface of the baked good is brushed with an egg wash (can also place a pan of hot water in the oven or spray the baked good with water periodically during baking) before baking so the crust will be nicely browned and glossy. How long the baked good stays fresh is dependent on the sugar content. French breads that do not contain sugar have a very short shelf life. On the other hand, a sweet dough that contains sugar can stay fresh for several days. Yeast - "the soul of the bread". "Bread deals with living things, with giving life, with growth, with the seed, the grain that nurtures. It is not coincidence that we say bread is the staff of life." When yeast is used in baked goods (breads, Danish pastries, brioche, croissants, etc.) it not only increases the volume but also improves the texture, grain and flavor of the bread. Sweet Yeast Dough needs to contain more yeast (can be up to double the amount of yeast used in bread dough) because the extra sugars in the dough tends to slow down the yeast. Proofing - the testing of the yeast to make sure it is still active. This is done by dissolving the yeast in a warm liquid to which sugar or flour have been added. This mixture is then set aside for 5-10 minutes and should become foamy and bubbly. - at less than 50 F (10 C) the yeast is inactive. - at 60 F - 70 F (15 C - 21 C) the yeast action is slow. - at 90 F - 100 F (32 C - 38 C) the yeast is at its optimum temperature for fermentation. - at greater than 104 F (40 C) the yeast action starts to slow. - at 138 F (58 C) the yeast is killed. Note: If the dry yeast is added directly to the flour, the liquid that is added is warmer than usual because the whole mass of dry ingredients, as opposed to just the yeast, must be warmed in order to activate the yeast. Kneading - A technique used to combine and work a dough or mixture into a smooth and pliable mass. 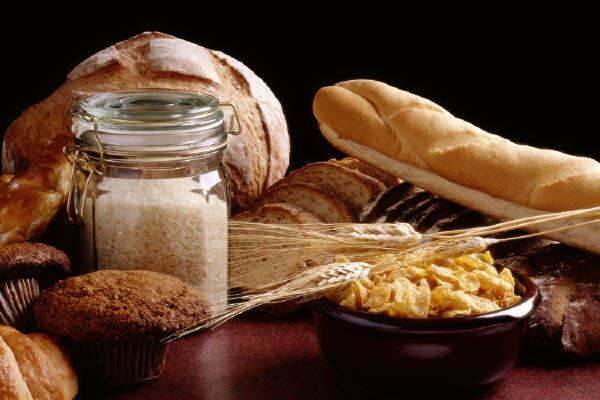 In bread making, kneading the dough also develops the gluten strands in the flour so it adequately holds in the gases released by the leavener (yeast) to produce a bread with good volume and texture. This technique can be done by hand, using the press-fold-turn action, or using a food processor or electric mixer with the dough hook.